The birthday of author Laura Ingalls Wilder will be commemorated at the Cultural Heritage Center in Pierre. 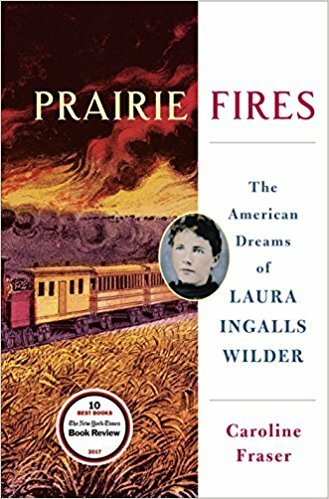 Caroline Fraser will speak remotely about her book, “Prairie Fires: The American Dreams of Laura Ingalls Wilder” at 7 p.m. CST on Tuesday, Feb. 13. “‘Prairie Fires’ was selected as one of the New York Times Book Review’s 10 Best Books of 2017. This program gives people the opportunity to learn the author’s insights into the book,” said Catherine Forsch, president of the South Dakota Historical Society Foundation. The foundation, which is the nonprofit fundraising partner of the South Dakota State Historical Society, and the South Dakota Historical Society Press are sponsoring the free program as part of the History and Heritage Book Club. Everyone is welcome to attend. Wilder was born on Feb. 7, 1867. Her “Little House” books continue to shape ideas of pioneer life on the American frontier in the late 1800s. “Pioneer Girl Perspectives” is a collection of essays edited by Nancy Tystad Koupal, director of the Pioneer Girl Project, and published by the SDHS Press. Fraser contributed an essay to “Pioneer Girl Perspectives” that examines the relationship between Wilder and her daughter, Rose Wilder Lane. The professional relationship between Wilder and Lane is at the heart of “Prairie Fires,” according to Fraser. She will discuss this relationship during her talk on Feb. 13. Fraser is editor of the Library of America’s two-volume edition of Wilder’s “Little House” books and has written about Wilder and other topics for magazines and other publications. She holds a doctorate in literature from Harvard University. People in De Smet, Wilder’s childhood home, will be able to participate in the program at the De Smet Middle School through the state’s video conferencing network. They will be able to see, hear and talk to Fraser and people at the Cultural Heritage Center. People in other locations who would like the program broadcast to a location such as a school or university on the DDN should contact (605) 773-6006 for more information. “Prairie Fires,” “Pioneer Girl” and “Pioneer Girl Perspectives” are all available at the Heritage Stores at the Cultural Heritage Center and the Capitol. he South Dakota State Historical Society is a division of the Department of Education. The State Historical Society, an Affiliate of the Smithsonian Institution, is headquartered at the South Dakota Cultural Heritage Center in Pierre. The center houses the society’s world-class museum, the archives, and the historic preservation, publishing and administrative/development offices. Call (605) 773-3458 or visit www.history.sd.gov for more information. The society also has an archaeology office in Rapid City; call (605) 394-1936 for more information.